The bedroom is a place in which to get away from the household's clamour and enjoy precious moments of solitude. It must, therefore offer not just privacy, but also intimacy and comfort. 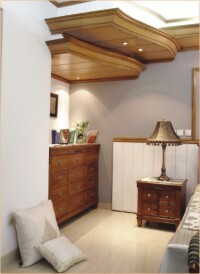 In bedrooms the use of space should create a sense of warmth. The placement of furniture dictates a bedroom's flow of traffic and defines sleeping, dressing and conversation area. Making a success of a small space remains the greatest challenge for many of us, but the imagination and ingenuity required often result in unexpected charm. The bed is the focal point of a bedroom. 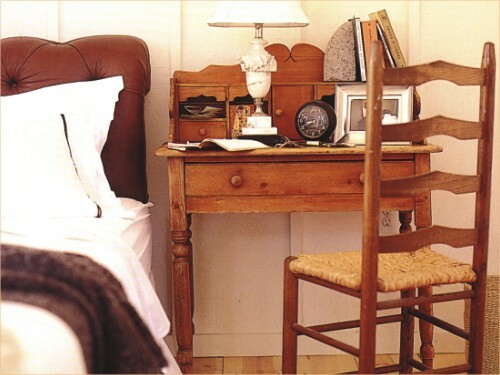 Closet, dressing table, reading table or sitting arrangements are also important for a bedroom. You can choose a bed suited to your needs in your room as well. A king-sized bed in a tiny room is obviously not a good idea. Always make sure there is ample room to access the bed from both sides. It is easier for changing sheets or to swing out the wardrobe door. We usually use matching bedside tables beside the bed. This is also the preferred spot for a table lamp, telephone, and other accessories. But if you want to create a drama for your bedroom or your teenaged family member, you can think in a different way. The bedside table does not have to be designed specifically for the bedside. In fact anything can serve the same purpose- a dining chair, a stack of books, an upturned antique crate, or a floating wall shelf instated for each reach. Sometimes a Moroccan or Balinese tea table or vintage red safe or wooden desk performs double duty as a nightstand and a work area. Stacked metal trunks, freshly painted with white enamel, provide sleek storage and a large surface for accessories. The shape of the bed and the style of its linen set the tone for a bedroom. If you want maximum flexibility for the style of your bedroom, an upholstered headboard can be slip covered easily to fashion a new look. Warm colours, plush textures and casual clutter make a room seen more intimate, while pale colours, sleek surfaces and minimal styling make even the smallest room seem spacious. Whatever the size of your bedroom, little touches count for a lot. A plush rug eases the cold on winter nights. It's not a showcase you are creating, but a personal haven. Make it inviting, make it soothing and make it yours. The concept of cocooning started from the mid 90's, a trend that has yet to reach its zenith. The bedroom transformed from just a utilitarian space to lay your head at night to a second living room filled with puffy comforts. Being the place where people spend a full one-third of their lives, a bedroom has positioned itself as a multi-purpose space for living, working, relaxing and sleeping. And with the concept of bedroom cocoons, the market noticed emergence of categorised bed linens that came in extensive varying types. Depending on your preferred style in matching the ambience and price considerations, you can select your bed linens from the wide range of bedding shops located at Islampur, Nilkhet, New Market, Hatirpool and Gulshan Avenue. If you are price savvy and looking for casual bed linens with great quality, the ideal place to shop would be Islampur Market located near Chawk Bazar, old Dhaka. The market caters to consumers who prefer cotton fabrics with the possible pre-conception that natural fabrics allow skin to breathe and is of better quality than synthetic fabrics. Madaripur Bedding at Islampur, offers custom-made complete bed linen sets comprising of four regular sized pillow covers and a bed sheet. You can select the fabrics and get them sewed on the spot. The price of a double bed-sheet and matching four regular sized pillow covers ranges from TK 500-700, depending on the quality of the fabric. The bed-sheets come in varying sets of floral patterns and cartoons on patchworks of bright colours with faux stitch for children's beds, bold geometric motifs on soothing colours for single beds, and classic nautical shades for double beds. The colour shades are available in apple green, denim blue, sunflower yellow, candy pink and mandarin orange. Apart from Islampur, offering an extensive colour palette and design patterns to choose from, New Market remains the one-stop spot for buying bed linens. Home Textiles is a popular choice, which has trendy motifs on lively colour backgrounds. 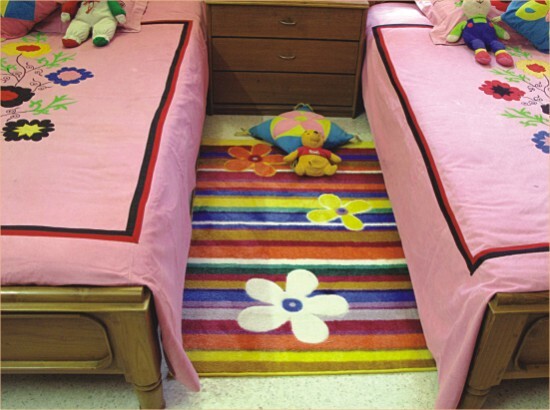 New market bedding store shelves also have bed linens suitable for children. Sizes available are: twin size and single. Bed sheets for children come in lime green and white floral sets with fuchsia accents and stripes with a splash of lemon meringue. Available in sets of regular size, pre-stitched two pillow covers, a side pillow and a bed sheet, the prices range from Tk 300-450. And if you plan to buy new pillows as well, the ideal place would be Nilkhet Bedding Market situated near the New Market Circle. Pillow sets vary depending on size and nature of cotton fabric. You can select your size and quality of cotton and order pillows. Or you can buy readymade pillows as well. Ready to order pillow sets include- four regular sized pillow and one side pillow- all at the cost of Tk 800. However, while shopping from Nilkhet or New Market do not forget to utilise your bargaining power. If luxury bed linens are on your shopping list, then the perfect places to visit are Elephant Road and Gulshan Avenue. The shops located there offer bed linens for all bed sizes- single, twin, full, king and queen. Known for their exclusivity, the bed linen items sold here are quite pricey yet worthy, considering the quality producing a smooth, shiny finish. The prices are from TK 1400 onwards. The luxury bed linen fabrics are mainly soft and luscious habotai silk (also known as China silk), elegant and sophisticated dupion silk and satin, providing a slippery, silk-like, cool lustrous surface. The colour palette for luxurious bed sheets consist of light and smooth colours like- pink, dark chocolate, green, honey, sage, lavender, purple, lilac, crimson and gold. The duvets are intricately quilted with diamond braid patterns having cotton frills in the lines. Subtle vermicelli designs accented with crisp hemstitch, rich paisley designs with elegant satin-stitched details, vertical leaf motif in subtle calming shades of green and beige, shades of cool plum with sprawling vines with woven blossoms, solid colour fabrics with circular patterns embroidered in a shimmering thread, etc., are some of the specialty picks available. Another exclusive option available at Gulshan is pillow covers with scalloped edges and lace trims with vivid prints and embroidered details. Bed linens have an appeal to stylish consumers looking to dress their boudoir the same way they dress themselves: in vibrant colours, natural fibres and classic styles. From glamorous lustre to earthy textures, bed linens are believed to express the sense of self in their surroundings. Be it a zesty ambience with bold colours, a splash of serenity, or a cool comfort zone- bed linens can emerge as the key in setting the atmosphere. So, ready to go shopping?